Linear View | Great gluten free recipes for every occasion. Preheat your oven to 375°F. Grease an 11-inch x 7-inch rectangular or oval baking dish (or a 9-inch x 9-inch square pan) and set it aside. First, prepare the crumble topping. In a medium-sized bowl, place the flour, xanthan gum, oats, granulated sugar, and salt, and whisk to combine. Add the brown sugar, and mix to combine, working out any lumps in the brown sugar. Add the butter, and mix to combine well. The mixture will be thick. Place the bowl in the refrigerator to chill for about 10 minutes or until firm (or the freezer for about 5 minutes). To make the filling, in a large bowl, place the tapioca starch, sugar, and salt, and whisk to combine well. Add the berries or stone fruit, and toss to coat. Transfer the filling to the prepared baking dish, and spread it into an even layer. Remove the crumble topping from the refrigerator and break it up into large chunks with a fork. Scatter the topping in an even layer all over the top of the fruit filling. Press gently on the crumble topping to ensure that it adheres. If you’re making a berry crumble, place the uncovered baking dish in the center of the preheated oven and bake for about 30 minutes, or until the fruit is bubbling and the crumble topping is lightly golden brown. Remove from the oven and serve warm. If you’re making a stone fruit crumble, spray the underside of a piece of aluminum foil with cooking spray, then cover the baking dish tightly with the foil. Place it in the center of the preheated oven and bake for 20 minutes. Remove the foil and continue to bake until the crumble topping is golden brown and the fruit is fork tender (about another 15 minutes). Preheat your oven to 325°F. Grease or line the wells of a standard 12-cup muffin tin, and set it aside. In a large bowl, place the flour, xanthan gum, oat flour, baking soda, baking powder, salt and cinnamon, and whisk to combine well. Add the brown sugar, and mix, breaking up any lumps in the brown sugar. Add the shredded carrots, shredded apple, dried fruit, and coconut chips, and mix to combine. In a separate small bowl, place the oil, eggs, vanilla, and sour cream, whisk to combine well. Create a well in the center of the large bowl of dry ingredients, add the wet ingredients, and mix to combine. The muffin batter will be thick but soft. Fill the prepared wells of the muffin tin completely full with the muffin batter, then shake the pan back and forth to distribute the batter evenly in each well. Sprinkle the top of each muffin with the (optional) whole oats. Place the muffin tin in the center of the preheated oven and bake, rotating once, until the muffins are lightly golden brown and a toothpick inserted into the center comes out clean (about 22 minutes). Remove the tin from the oven and allow the muffins to cool in the tin for at least 5 minutes before transferring to a wire rack to cool completely. Repeat with the remaining batter. 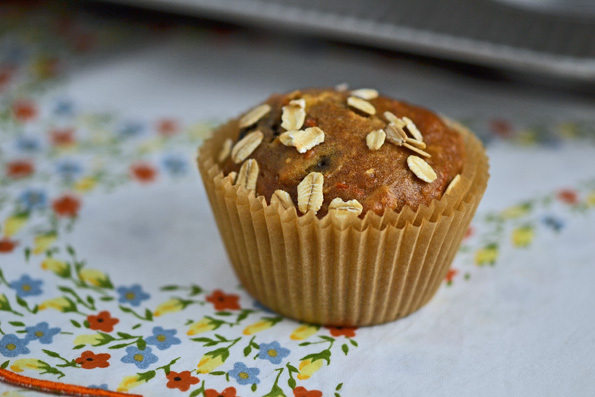 Store muffins in an airtight container at room temperature for 2 days. Freeze any leftover muffins tightly wrapped in a freezer-safe container for up to 2 months. Originally published on the blog in 2013. Photos, video, most text new; recipe largely unchanged (method altered a bit). Rich in peanut butter flavor, these super chewy blonde brownies are made without any dairy or grains and they’re naturally gluten free. These incredibly simple, fudgy and chewy brownies are a great rice-free alternative to our classic gluten free peanut butter brownies. They’re made with peanut butter, brown sugar, eggs, and finely ground blanched almond flour plus a few optional chocolate chips. I love baking with nut butter in general, and my favorites tend to be peanut butter and Nutella, the chocolate hazelnut spread. Whenever I publish a recipe that uses peanut butter, I’m asked if you can use Nutella, which is peanut-free. Whenever I publish a recipe that uses Nutella, I’m asked if you can use another nut butter, like peanut butter. But they’re sadly just not interchangeable in that way, but I hadn’t figured out quite why—until now. Nothing illustrates the difference between baking with peanut butter (or almond butter) and baking with Nutella better than a comparison of this recipe for 4 ingredient peanut butter brownies with our 3 ingredient Nutella brownies. I always bake with “no-stir peanut butter,” which just means that it’s the kind that doesn’t need to be stirred after opening. It typically has some oil and some sugar added to it, which creates a perfectly blended, emulsified nut butter. The drippy kind of natural peanut butter, which contains only peanuts and salt, is much trickier to use in baking. But even the less pure, no-stir peanut butter varieties are mostly peanuts (unlike Nutella—scroll down for that discussion). Peanut butter is a great substitute for flour, often, like in our flourless chocolate peanut butter muffins, which are rich and flavorful, but still have a light and tender crumb like a proper muffin. Peanut butter is also the base of classic flourless peanut butter cookies, which have no flour of any kind, but still have that crisp outside and chewy inside that some of the best cookies have. They’re even made with similar ingredients to these 4 ingredient peanut butter brownies (sugar, eggs, peanut butter, with a bit of baking powder). The main difference between these other peanut butter recipes and this brownie recipe is the addition here of finely ground, blanched almond flour. It creates that fudgy, chewy texture of the best brownies. Nutella has nothing short of a cult following. I had never even heard of it until I spent a semester in Spain when I was in my junior year of college. I saw children eating it spread on toast for breakfast, and was somehow completely confused by it when they explained it to me. Nutella is a great peanut-free alternative for households where someone is allergic to peanuts. It’s not at all the same as peanut butter, though. I developed this recipe when, out of curiosity, I tried replacing the Nutella in some of our simplest Nutella recipes, like our 3 ingredient Nutella cookies, with peanut butter 1 for 1. I had a feeling that it wouldn’t work, but I had been asked so many times over the years I just had to try it. Even though the recipe has no added oil, the natural oils in the peanut butter leaked out during baking and essentially the cookies and brownies fried in their own oil. The result was a greasy, dense and sadly inedible mess. Hazelnuts are not that different than peanuts or almonds in baking, so why the dramatic difference? Well, I finally realized that the first ingredient in Nutella is sugar. Sugar isn’t just for sweetening baked goods. It’s a tenderizer, too, which is why low-fat baked goods often have so much sugar. So by combining sugar (brown sugar in this recipe) with peanut butter, we’re able to mimic the behavior of Nutella in this recipe—and probably in other recipes that are developed with Nutella instead of another nut butter. Egg-free: There are 3 eggs in this recipe, and the recipe itself only contains 4 essential ingredients. I’m afraid you can’t make these egg-free. Peanuts: In place of peanut butter, almond or cashew butter would probably work really well (and have a more neutral flavor profile, making these more like blondies than peanut butter brownies). The ingredient list specifies “no-stir” peanut butter, which is the type of peanut butter that is fully integrated the moment you open the jar, with no need to stir. Almond flour: Be sure you are using blanched almond flour, not almond meal which is more coarsely ground and made from almonds that still have their skins intact. I like Honeyville brand almond flour or almond flour from nuts.com. You can actually make this recipe with oat flour in place of almond flour. Just grind certified gluten free old fashioned rolled oats in a blender until a smooth powder forms. I find that a blender works better than a food processor for grinding oats. You could also try using finely ground hazelnut flour. Chocolate Chips: You can leave out the chocolate chips entirely, or replace them with another type of chip or even chopped nuts. White chocolate chips would be excellent. Sugar: Swerve brand non-sugar sweeteners makes a brown sugar variety. Swerve and other alternative sugars do tend to be drying to baked goods, so you might need to add a bit of milk or water to reach the desired consistency in the raw batter. Preheat your oven to 325°F. Line an 8-inch square baking pan with unbleached parchment paper, making sure it overhangs the edges on all 4 sides. Set the pan aside. In a large bowl, place the peanut butter. You can warm it in the microwave for about 1 minute to loosen it and make it easier to blend, but it’s not essential. Add the eggs and sugar, and beat with a hand mixer on high speed until as smooth and light as possible. Add the almond flour, and beat again on medium-high speed until as smooth as possible. The batter will be very sticky. Add the optional chocolate chips, reserving a few to sprinkle on top of the batter in the pan. Transfer the batter to the prepared baking pan, and spread into an even layer using a moistened offset spatula or knife. Sprinkle the reserved (optional) chocolate chips evenly over the top. Place the baking pan in the center of the preheated oven and bake for about 30 minutes, or until the brownies are puffed and set all the way in the center. They will be firm to the touch as well. Don’t overbake or they will be dried out. Remove the pan from the oven and allow the brownies to sit at room temperature for at least 30 minutes or until no longer hot to the touch. Using the overhung parchment, lift the brownies out of the pan and place on a cutting board. Slice into 9 or 12 equal squares using a sharp knife. Wrap any leftovers tightly and store at room temperature or in the freezer.